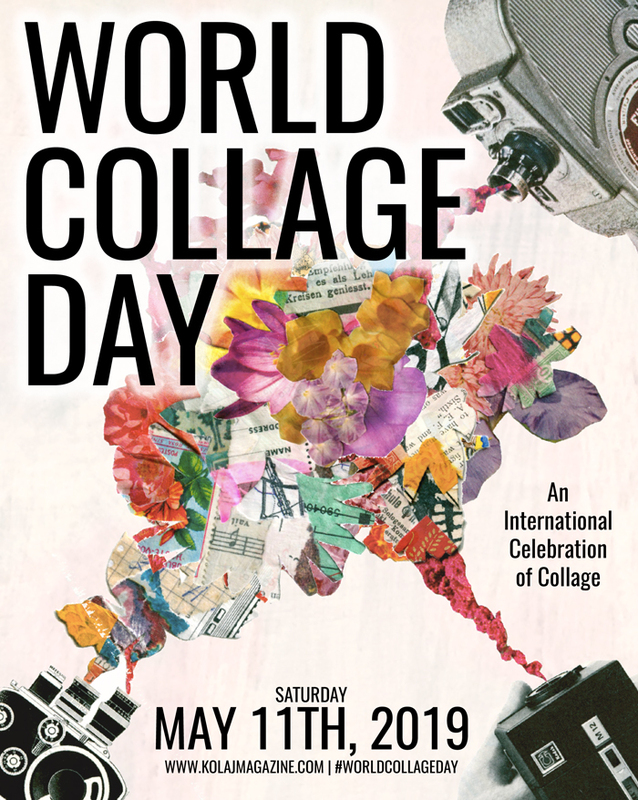 Kolaj Magazine is pleased to announce Michael Pajon as the 2018 World Collage Day poster artist. 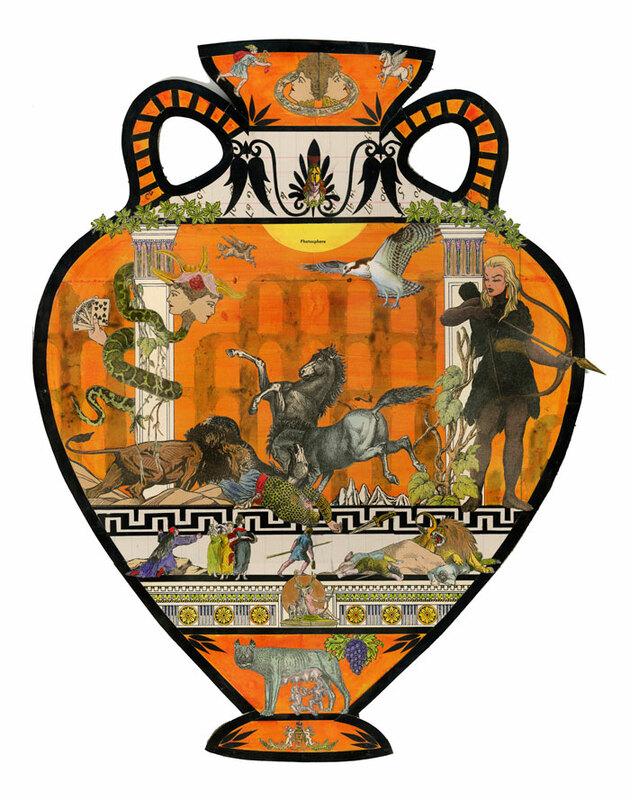 Based in New Orleans, Pajon crafts elaborate, dense compositions inspired by Catholic reliquaries, antique cabinet cards, carnivalesque board games that trade on complex narratives and still-life-esque vanitas and he does this with a deep understanding of his source material; its functional place in history; and its present-day obsolescence. The source materials for Pajon’s collages are integral to his process. He sees his practice as a means of bringing old, outdated textbooks, readers, medical books, the ancient encyclopedic knowledge, into a contemporary dialogue with the viewer. In this sense, a finished work is a bridge over time. 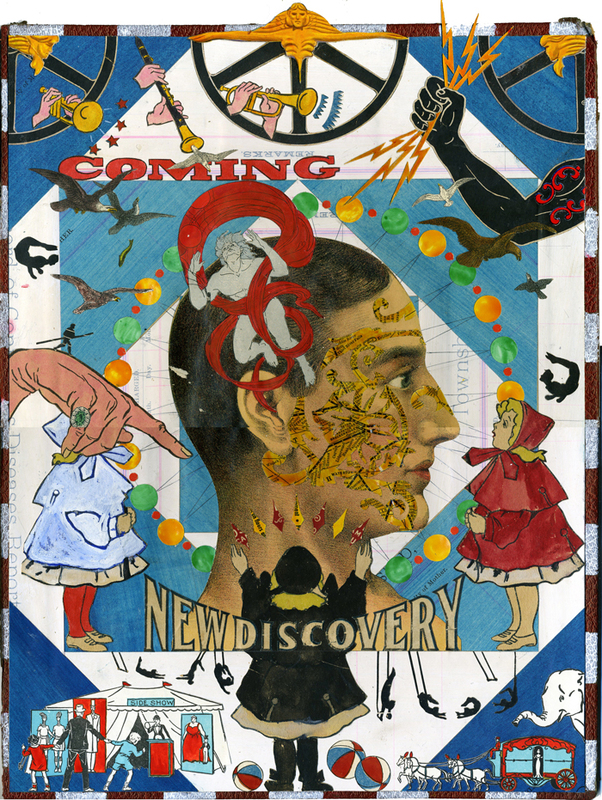 Pajon is not simply using the visual language of the paper fragments he includes in his collage, he is using their history–the nostalgic images of children from elementary readers, the off-portrayal of wildlife from inaccurate encyclopedias, and the over simplified illustration of human anatomy–to weave a narrative about our place in the world and how we have come to understand it. 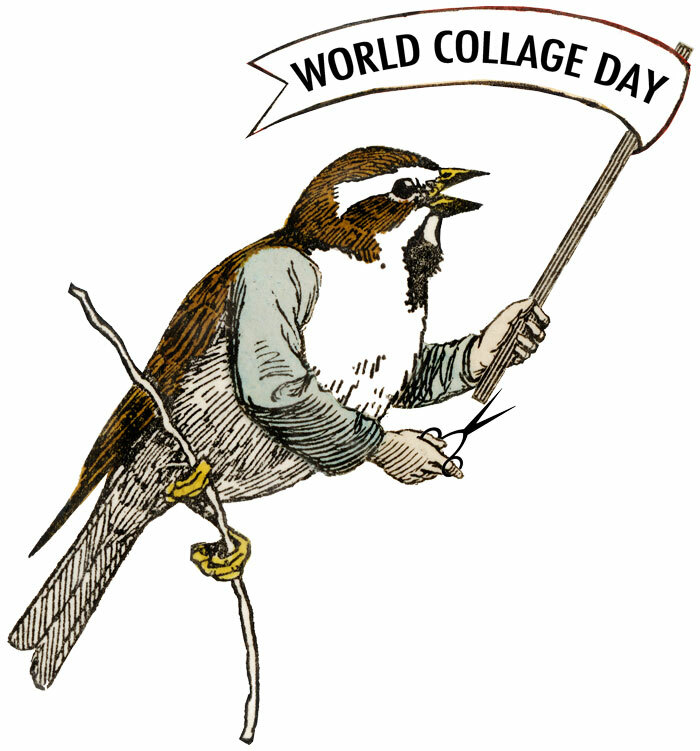 For World Collage Day, Pajon composed an image of an anthropomorphized bird, his human hands hold a pair of scissors and a banner heralding the day. 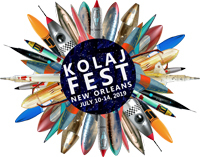 Pajon’s image will grace the cover of a Special Edition being prepared by Kolaj Magazine that features Cut Out Pages, artist profiles, and stories about collage. The image will also be made into an enamel pin. A native of Chicago, Michael Pajon lives and works in New Orleans, Louisiana. He holds a BFA from the School of the Art Institute of Chicago. His work has been shown in solo and group exhibitions in New Orleans, Chicago, Miami, New York, Los Angeles, Basel, and London. 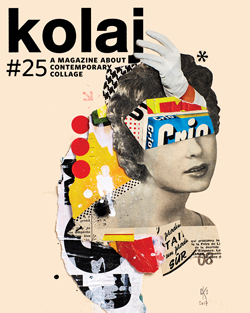 Pajon’s collage, Baptised by the Sea in Flayed Skin and Coral Crown, was featured on the cover of Kolaj #15 along with a profile by Ric Kasini Kadour, “A Bridge Over Time”. 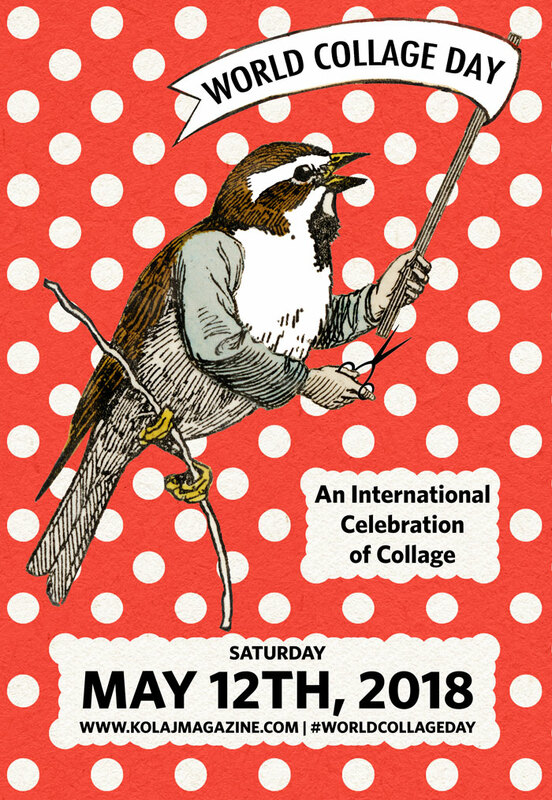 Later this year, Pajon’s work will be on display at the Jack Fischer Gallery in San Francisco as part of the collage exhibition “Remains to Be Seen”. Visit www.michaelpajon.com for more information.